Don’t tell us that Hillsong worship Jesus. Don’t tell us that Hillsong are Christian. The fact is this: Hillsong are Roman Catholic. The truth is so plain to see when you watch the below video of Terry Crist explaining Hillsong’s role in their”worship music” and exposes an agenda behind the Hillsong’s annual musical conference in their attempt to unite Protestantism with the Roman Catholic Church. Hillsong has picked their side and are deliberately working against Christianity, encouraging people to worship the god of Roman Catholicism. This is undeniable and is made perfectly clear if you choose to read all the resources and links available in this article. The Roman Catholic Church (RCC) teaches that a Christian is not saved or justified before God by grace alone through faith alone through Christ alone. The magisterium of the RCC damns anyone to hell who believes this is the gospel. Salvation comes through the RCC. The Roman Catholic Church (RCC) condemned the Protestant Reformation at the Council of Trent in November of 1544. The RCC were reacting against Martin Luther’s writings on the gospel of salvation. Luther and many others were attempting to reform their church to the Word of God. It was the Roman Catholic Church that anathematized (eternally damned/condemned) Martin Luther and the Reformers to hell by the authority of the “Apostolic” and “Divine” authority of the “infallible magisterium” of the Roman Catholic Church. This is why the Roman Catholic Church is another religion – not Christian. Their authority is in man – not God’s Word. We’ve even alerted our readers to the fact that Roman Catholicism still holds to these errors that eternally damn people to hell. This is a false doctrine that was easily biblically refuted by the Protestant fathers. It was for protesting against this doctrine that the Roman Catholic church burned Protestants at the stake. It was this doctrine that made the RCC proclaim that the Protestant fathers were not Christian. The Word of God teaches that the guarantee and the assurance of Heaven and eternal life is the indwelling power of the Holy Spirit in the person who stands on Jesus’ work on the cross of calvary. It is the scriptures on which the Protestant movement stands on. The Roman Catholic Church still relies on the infallibility of the Pope and its “traditions of men” as the final authority. Not the bible. You would notice the ‘Source’ link (Hillsong: This is war!) sends you to a previous article where Hillsong partakes in the Roman Catholic ‘World Youth Day’ event back in Sydney 2008. Their Hillsong ‘UNITED’ band lead worship on the final night while Roman Catholic’s participated in their pagan Eucharist practice. Since witnessing Hillsong partake in this pagan event, we have been wondering for a long time when Hillsong would finally make that decision and “return home” to the whore of Babylon. We don’t know when exactly Hillsong converted to Roman Catholicism. However, Terry Crist gives us valuable insight to how he saw Hillsong’s role in uniting Roman Catholics, Evangelicals and Hillsong believers together in the name of Jesus Christ. Below, Crist shares this important information as part of the Hillsong family. Now, he and his church are proudly part of the Hillsong movement. As Terry Crist informs us, Hillsong appears to have been working with the Roman Catholic Church behind the scenes to deceive Christians into being “united” with the pagan Roman Catholic Church? And how did they do this? Through their Hillsong music and conferences. “I’m Dr Terry Crist, the senior Pastor of ‘City of Grace’ and the Chair for the ‘Governor’s Council of Faith and Community partnerships’. And I want to congratulate Dr Gary Kinnaman, Joe Tersini, Bishop Olmsted and Bishop Navaras for their extraordinary work in bringing together Catholics and Evangelicals. Something powerful happens when we rally around the person of Jesus. Our church is a member of a global family of churches, called Hillsong. Our primary church is located in Sydney, Australia, where I’m preaching this weekend, otherwise I would be with you. And it’s been beautiful to see over the last few years how the Catholics around the world have lifted the songs of our church, and have begun singing them universally, songs like, ‘Shout to the Lord’ and ‘Mighty to save’. In fact the demand for our kind of worship has become so popular in charismatic churches that are Catholic, over the last few years, we have actually offered a tract at Hillsong Conference for Charismatics, Catholics and Evangelicals to come together for worship. And it’s a beautiful thing to see what happens when we rally around the person of Jesus. Isaiah 52, verse 8 says, ‘when the Watchman sing together, then they shall see eye to eye’. So many times we tend focus on what divides us, instead of the man who unites us. Jesus is that God man, who calls us all to himself, and when we respond to that something transcendent happens, something that unites us at a place so much deeper than just mere agreement. And out of that unity comes a shared mission, out of that comes a shared transformation, and that’s really at the core of my heart, my heart longs for the day when we work together and we worship together and out of that we transform our city together, to the glory of God. 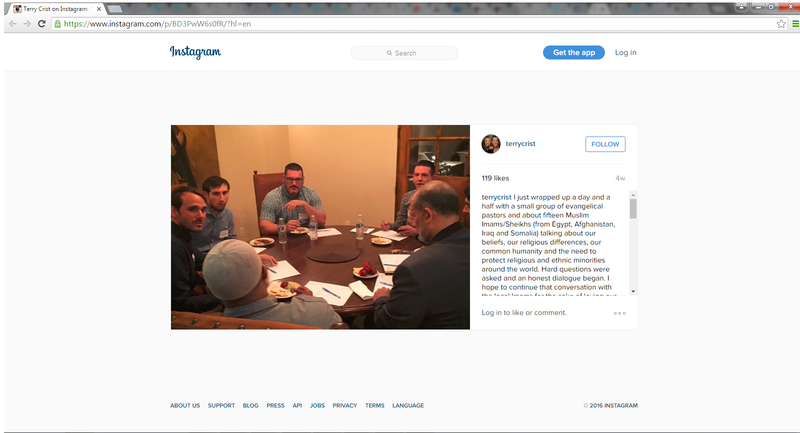 I just wrapped up a day and a half with a small group of evangelical pastors and about fifteen Muslim Imams/Sheikhs (from Egypt, Afghanistan, Iraq and Somalia) talking about our beliefs, our religious differences, our common humanity and the need to protect religious and ethnic minorities around the world. Hard questions were asked and an honest dialogue began. I hope to continue that conversation with the local Imams for the sake of loving our neighbors, sharing my faith, advancing the common good of our community, and protecting religious freedom here and abroad. I’m planning to share a little more about this in my message on Sunday. Hope to see you there. Photo cred and special thanks to Ps@BobRobertsJr and Ps @TylerJPHX for facilitating the conversations. Remember – Terry Crist has been personally mentored and endorsed by Brian Houston and has even spoken at the Hillsong headquarters in Sydney. Crist is simply pushing Brian Houston’s ecumenical agenda in the local community to expand Hillsong’s music franchise. Brian Houston: A skilled liar at work… or is it his critics? It is important for Christians to realise that Hillsong is not a Christian church. They have aligned themselves with the Roman Catholic church. Hillsong’s god is no different to the god that the Babylonian king that forced Shadrach, Meshach, and Abednego to worship. The difference Babylon and Hillsong’s god is this, Hillsong just slap ‘Jesus’ on their “golden image” and have upgraded their musical instruments for worship. That’s how Hillsong’s authority (magisterium) works. Their authority (magisterium) is no different to the authority (magisterium) of the Roman Catholic Church. If you are a critic of Hillsong, it seems you are beyond salvation. If you criticise Hillsong’s pope-king and to expose what deity it is they worship, this will result in you being demonised, accused of being un-Christ-like, jealous and “religious”. And we’ve seen Hillsong personally hunt people down, malign their character and throw them (figuratively) into their “furnace”. You think that sounds extreme? The fact is people live in fear of the Hillsong mafia network in Australia. Just look how they treat people like Tanya Levin or speak of churches that question them or expose them of their unrepentant sins. According to Hillsong, people like Tanya Levin are beyond redemption. They’ve bent the knee to their constructed golden image, call all people together in a false unity and anathematized the Christian to the flames of Babylon. * UNITED – The New Order of the Latter Rain movement and the New Apostolic Reformation doctrine on worship teach that the pure worship is built when the church is UNITED. They use verses such as Psalm 133:1; John17:21; Psalm 22:3 and others like it. This is why Hillsong and other NAR church like C3 Church hold annual conferences that focus on UNITING denominations. They believe this is God restoring and uniting the church and bringing/ushering in and end-times revival. The NOLR and NAR achieved this deception by deliberately constructing the Charismatic Renewal/Movement which dumbed down both Roman Catholic theology and Protestant theology to create a false unity. What the pope and the NARismatic movement have in common are their mystical/gnostic practices, infallible apostolic authorities and the doctrine of the theology of glory (prosperity theology). This Terry Crist fellow going by this video is VERY BAD NEWS. I would personally avoid THIS DECEIVER at all costs. We are to unite together with others who are LIKEMINDED over TRUE BIBLICAL DOCTRINE. Not unite with others REGARDLESS OF DIFFERENT DOCTRINES for some WARM FUZZY EXPERIENCE. It is our TRUE CHRISTIAN DOCTRINE with respect to SALVATION that SETS US APART as Christians. We are the only ones NOT BASING OUR SALVATION ON OUR WORKS. Every cult trusts in THEIR WORKS. Thus why would anyone want to go backward and UNITE REGARDLESS OF DOCTRINAL DIFFERENCES?? That makes absolutely no sense !! Excellent article. I have a dear Australian brother who is deeply deceived by Hillsongs. They so brilliantly weave darkness and light together by mentioning the”person of Jesus Christ,” yet they don’t really know that person because they NEVER mention the fact that he came to earth to pay for our sins with his blood, and that we must repent, turning to Him from our sin. All we here is silly, worldly chatter mixed with vain and emotional worship. As you noted, the only thing we know is true is the word, and we must all eat it, drink it and breathe it. How is it that some Christians believe this new ecumenism is a move of God, and other Christians think it’s a great apostasy? Awww… thank you for the kind words fred 210006. Its is refreshing to read these comments and articles exposing so much greed at Hillsong and C3. They are not any more a “church” than a local automobile garage. If sites like this were not exposing them, and thus they knew they were not under so much external scrutiny coming from outside their “church”, they would be left completely unchecked and their Prosperity Gospel would be making even more financial promises to their parishioners. Their lets-have-heaven-on-earth ‘god’ would be offering many more toys…. exotic cars, mansions, sudden mysterious bank deposits, divine health, etc for all faithful tithers. This article is not based on any FACTS. What Crisp is saying has NOTHING to do with joining false doctrines. And everything to do with the fact that there are 10’s of thousands of people sitting in Catholic churches who need salvation. Hillsong or any other believers should realize that these people need to be reached. I am the first to admit the doctrine of the Roman Catholic Church is screwed up and many won’t find God . But accusing Hillsong of following Catholic doctrine because Hillsong United samg at their event or because Crisp wants to “unite” us all under the banner of Jesus Christ is pathetic journalism at its best. The only reason you all think its a good article is because it fuels your current biases. I have been a Christiam for over 20 years and have attended Hillsong for 5. I am not in their leadership but i have NEVER heard misleading or false doctrine taught from the pulpit. I would be the FIRST to leave if it did! Instead of sitting in your glass houses throwing stones try sitting in a few services and see the facts! What Hillsong church do you attend, Dierdre? 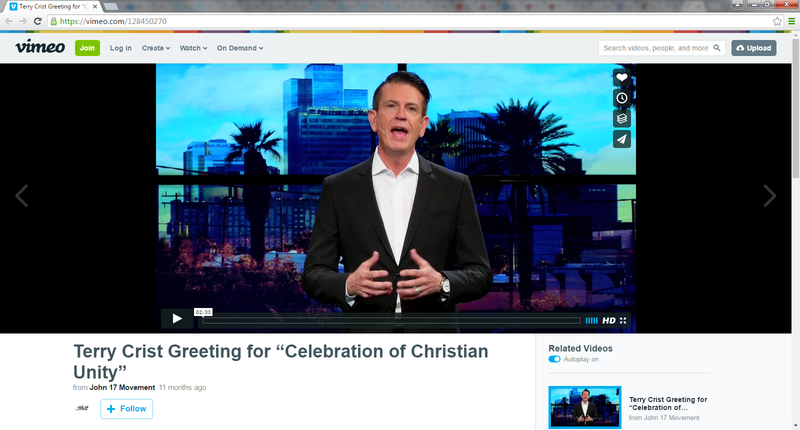 Crisp has recently come under the Hillsong banner in Phoenix with much fanfare from Houston. As for misleading or false doctrine taught from the pulpit? It’s a weekly discernable event for those using an open bible rather than an open heart. You havent heard any real biblical teachings coming from Hillsong either. Never anything misleading huh? Do you “NEED MORE MONEY!! !” Deirdre, lol? Unfortunately, you’re the LAST to catch on.